We have written many topical real estate articles, which have been published in national print magazines, television, WebTV, and on online real estate forums. Below are some of the "expert/authority" media coverage we have received. This two-hour video is a recording of a presentation I did on Ontario's mandatory Standard Lease Agreement (SLA), which is now required for most residential tenancies. The presentation discusses details each of the 72 clauses that I feel are 'missing' from the SLA and which form my Appendix B of the SLA. Compresses the SLA from 14 pages to 5.25 pages while retaining every letter and punctuation mark in the official .pdf version of the Ontario Standard Lease Agreement -- only the formatting has been edited in this Word version. Adding my own 72 clauses creates a total of 10.75 pages. User can password-protect the document so that only the fillable fields can be changed. Topic list and sample of compressed file can be found here. 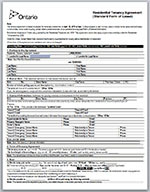 Ontario's Standard (form of) Lease (SLA) is 14 pages long and yet is not only confusing in places, heavily tenant-biased in others and providing all kinds of legal advice for tenants, it is missing a large number of critical tenancy clauses that will cause Ontario landlords no end of misery if the respective topics aren't addressed. This article is a primer for the first time and novice investor for determining the value of an investment property using Net Operating Income (NOI), as well as explaining the benefits and limitations of NOI. This is a follow up article to the primer above. It looks at extending your analysis to include the parameters and metrics that lenders use to assess the risk of their loan against your property, including Break-even Ratio (BER) and the Debt Service Coverage Ratio (DSCR) of the property (not the borrower). 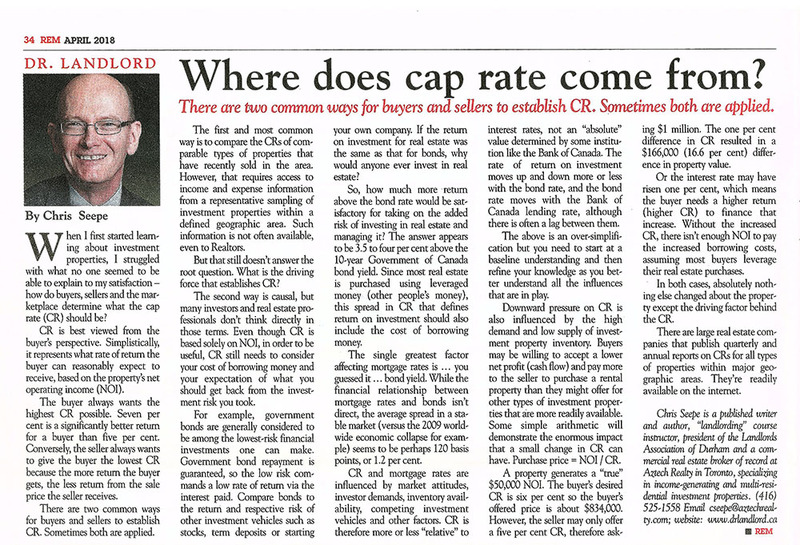 This article explains what cap(italization) rate is and especially what it doesn't tell you about the property you're considering buying. Most investors and realtors can calculate cap(italization) rate nad apply it to determine the baseline value of a property. 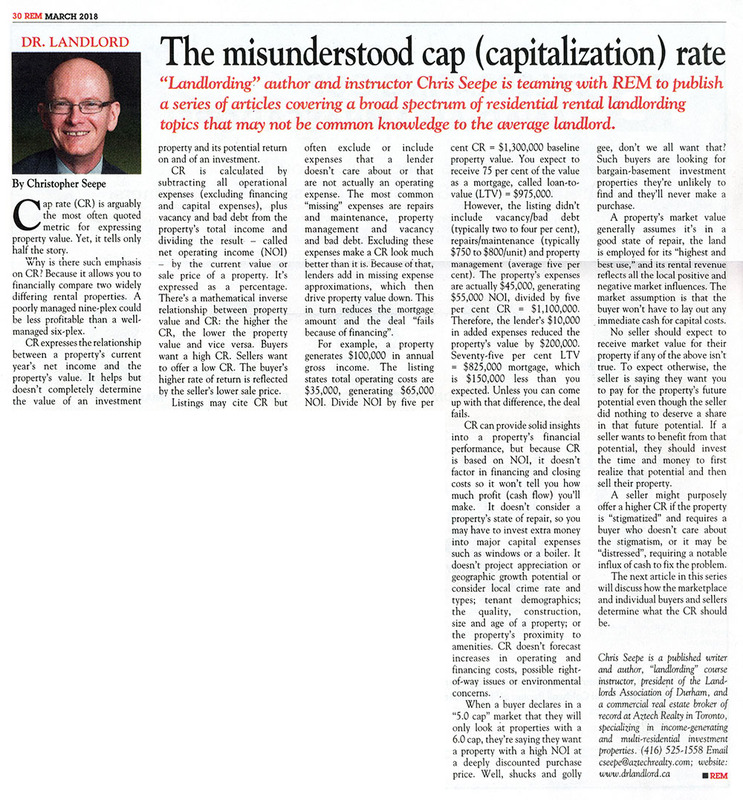 But where does cap rate come from? 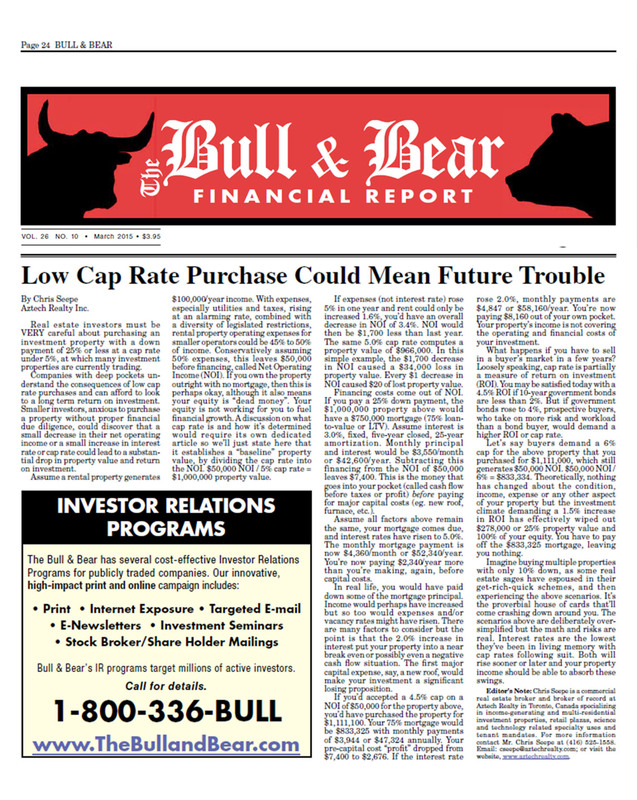 Who determines that a particular cap rate should apply to a specific building type in a local market? Real estate investors must be VERY careful about purchasing an investment property with a down payment of 25% or less at a cap rate under 5%, at which many investment properties are currently trading. Smaller investors, anxious to purchase a property without proper financial due diligence, could discover that a small decrease in their net operating income or a small increase in interest rate or cap rate could lead to a substantial drop in property value and return on investment. A 2% increase in the interest rate of a mortgage could lead to a 25% reduction in the value of your property and/or cause your property to have more costs than the income the property generates. As of April 30th, 2018 most Ontario residential landlords must use the provincial government's Standard (Form of) Lease agreement. If you don’t know the laws related to residential tenancy, you're almost guarantee as a realtor or landlord to become a victim of it. This article identifies some of the more obvious concerns and risks. The actual editable clauses can be purchased as part of the 'Handouts' package of the Landlording in Ontario real estate course. A sample of the clauses and a list of topics can be found here. The number one hedge against professional tenants and bad tenant behaviour is a solid qualification process; number two is a robust lease agreement. A landlord must be familiar with a confluence of Acts—Human Rights Code (HRC), Privacy Act, Residential Tenancies Act, PIPEDA, municipal by-laws, Fire Code, Building Code, Electrical Code, Municipal Act, Rental Fairness (for whom?) Act, Condominium Act, and more. If you think qualifying a tenant doesn’t require this breadth of knowledge then you’d be wrong. The 13-page agreement comprises a 7 page lease that misses many issues and concerns that I have as a landlord. I have crafted an Appendix B with 65+ clauses, based on the 80 topics listed in this summary. The actual editable clauses can be purchased as part of the 'Handouts' package of the Landlording in Ontario real estate course. The right to smoke in a rental property is not enshrined in any Canadian legislation, including the Canadian Charter of Rights and Freedoms and the Human Rights Code. 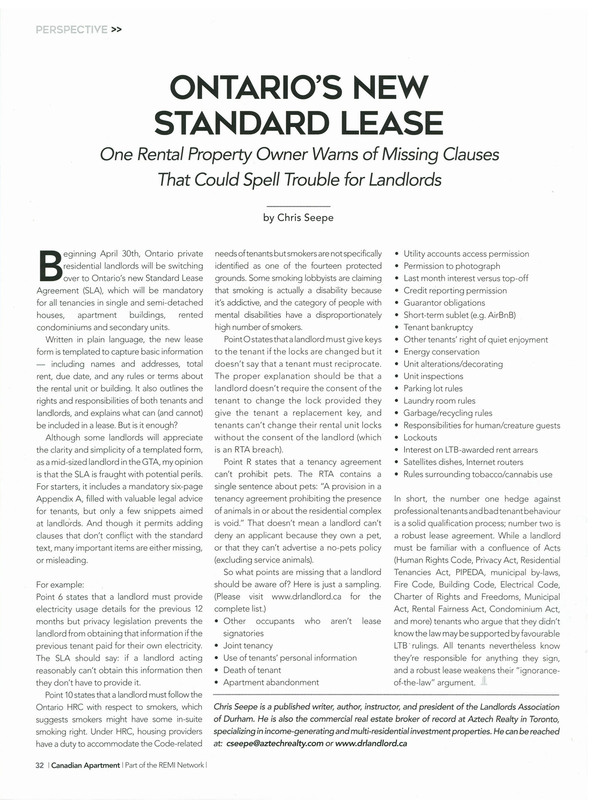 Here are some of the serious issues that can adversely affect a landlord and what I did to mitigate that risk and impact. 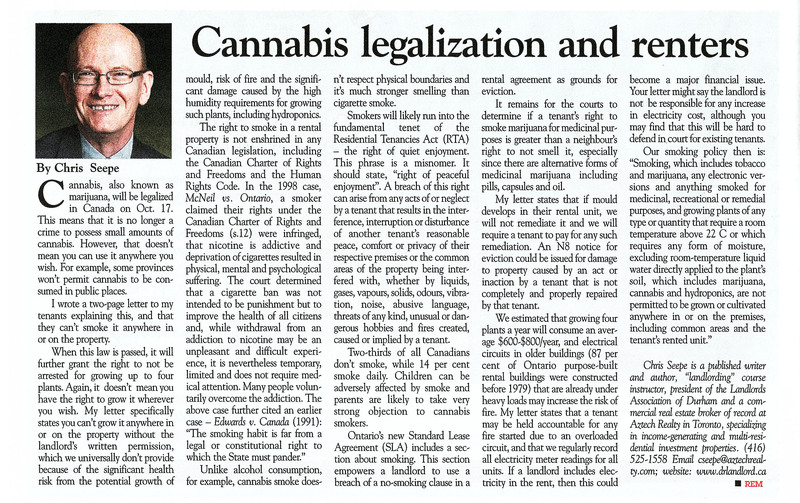 Chris Seepe is interviewed on his views of permitting tenants to grow and smoke cannabis in his apartment buildings. The right to smoke in a rental property is not enshrined in any Canadian legislation, including the Canadian Charter of Rights and Freedoms and the Human Rights Code. 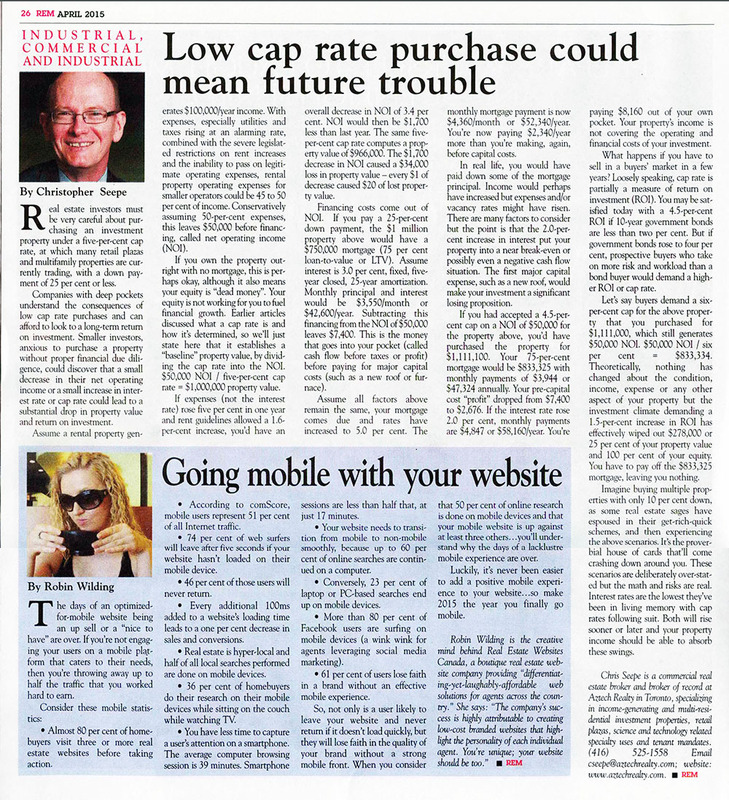 The same article published in a magazine targeted to property managers. According to Canada Mortgage and Housing Corporation (CMHC), more than a quarter of Canada's renters and 6.5% of homeowners can't sustain their residence.. The Federation of Canadian Municipalities (FCM subtle but slippery operative phrase to place blame on ‘market forces’ is misdirection and the Federation of Rental-housing Providers of Ontario (FRPO) June 2015 report titled, “Removing Barriers to New Rental Housing in Ontario” missed a variety of critical influences and driving factors. On who's shoulders does Canada's rental housing crising squarely rest, why and what can be done to address it? This is my summary report on the all-day event hosted by the Ministry of Municipal Affairs and Housing on January 31st, 2019 to bring together over 200 individuals with disparate agendas and interests to work together to find solutions to Ontario's housing (and affordable housing) crisis. As an investor, you should consider property tax rates of municipalities in which you’re considering buying (or building) a multi-unit rental property, not just for their unfair tax practice but also for the actual tax rate of multiresidential properties. Can a municipality justify the overhead cost to service 10 families in the apartment building being about five times higher than servicing the equivalent number of single family homes? There’s a powerful, compelling answer to addressing the pandemic affordable housing crisis with a huge financial pool available if the government would only take steps to unlock it. 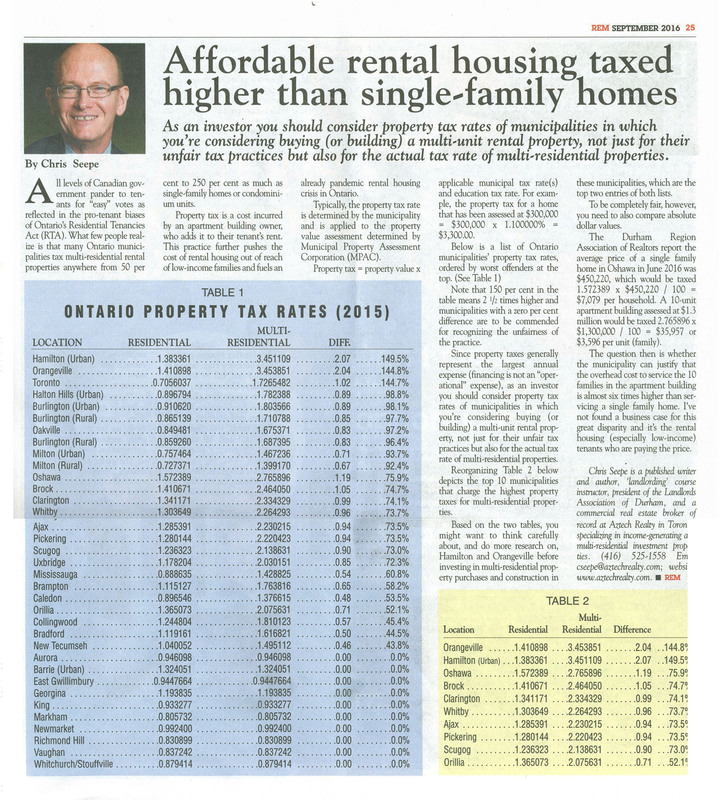 Ontario’s recent 'Rent Fairness Act' continues the brutal, gratuitous, dystopian, anti-landlord legislation meted out by short-sighted, vote-pandering politicians who have literally (not metaphorically) persecuted landlords for decades; all of it resulting in the national pandemic critical housing shortage. This article cites numerous examples. Investment property owners who don't earn their primary income from investment properties could face a much higher tax rate (Seepe cited but is not article's author). The real estate business is a constant emotional and financial roller coaster ride, and it’s easy to forget how fortunate we are. The next time you’re wondering why nothing’s going right, why is this happening to me and what did I do to deserve this, consider these pearls of wisdom in the form of inspirational quotes from some well-known and perhaps not-so-well-known thinkers. 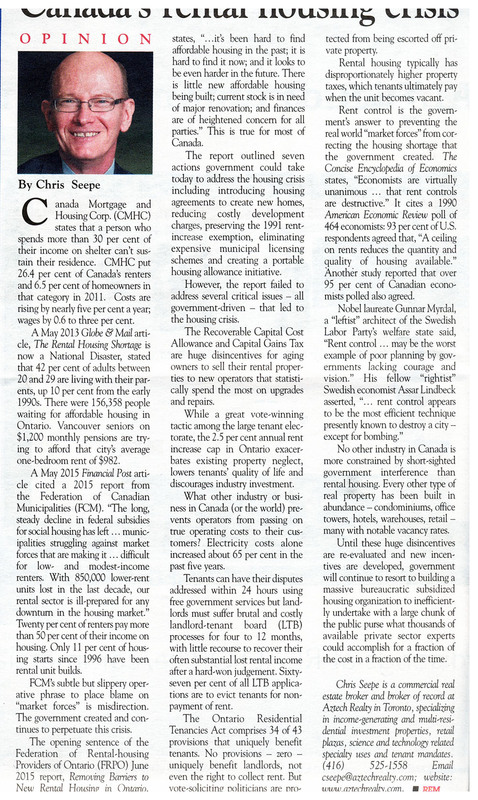 Chris Seepe is interviewed by Canadian Apartment magazine for his reply to this question . 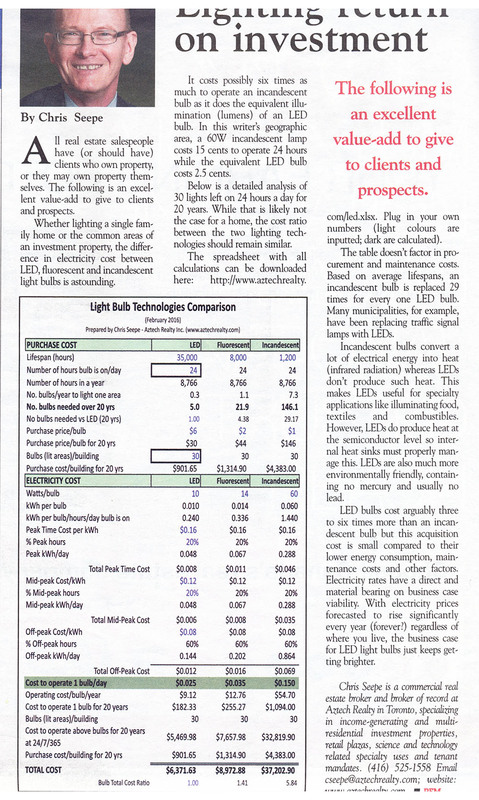 Whether lighting a single family home or the common areas of an investment property, the difference in electricity cost between LED, fluorescent and incandescent light bulbs is astounding. It costs possibly six times as much to operate an incandescent bulb as it does the equivalent illumination (lumens) of an LED bulb. This spreadsheet is a detailed analysis and comparison between purchasing and operating an LED, fluorescent and incandescent light bulb. The spreadsheet with all calculations can be downloaded from here so you can plug in your own numbers. <--- Accompanying do-it-yourself, downloadable, fully-modifiable spreadsheet. A “patent” defect is one that can be discovered by observation (“obviousness”) or inspection using generally accepted industry-standard practices. 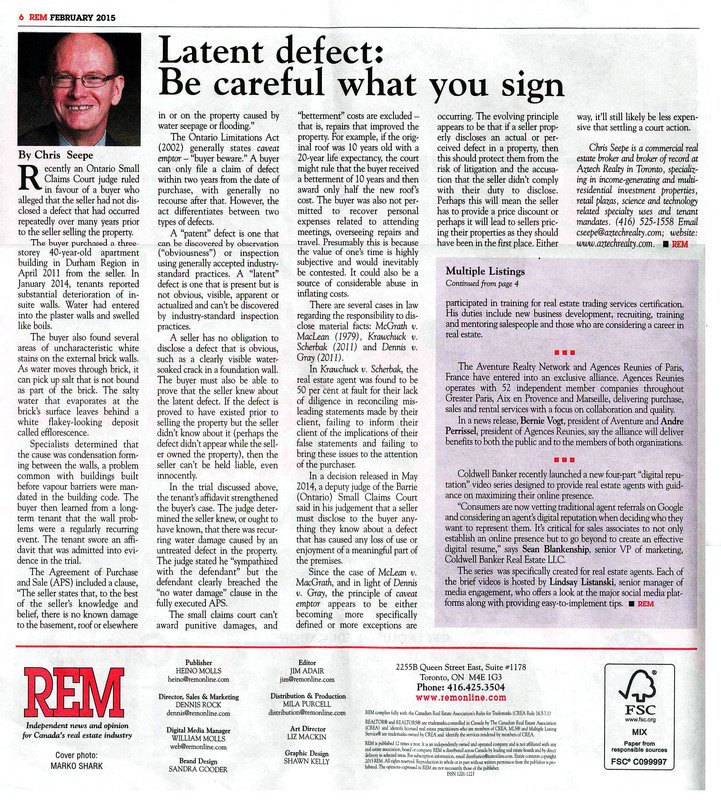 A “latent” defect is one that is present but is not obvious, visible, apparent or actualized and can’t be discovered by industry-standard inspection practices. The principle of caveat emptor appears to be either becoming more specifically defined or more exceptions are occurring. Fentanyl is an incredibly powerful synthetic opioid analgesic approved to treat chronic pain and as an anesthetic that's 100 times more powerful than morphine, 50 times more toxic than heroin, and 20 to 40 times more potent than heroin. Four salt-size grains of pure fentanyl can kill the average adult. 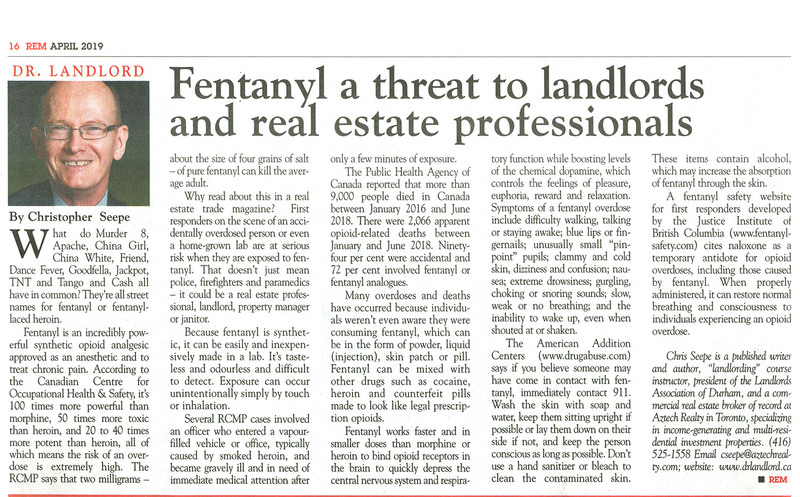 It can be a serious threat to first responders because fentanyl can be absorbed through the skin. 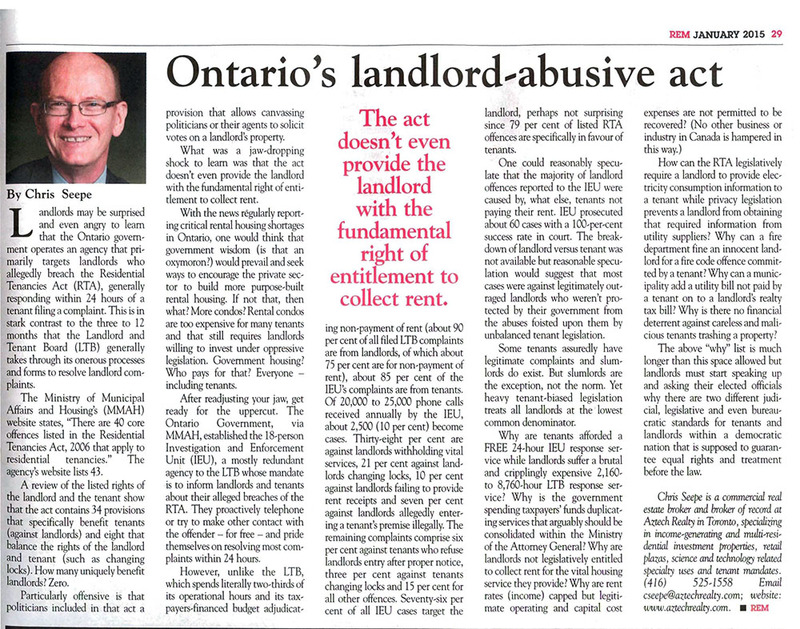 A review of the listed rights of the landlord and the tenant in Ontario's (Canada) Residential Tenancies Act shows that 34 provisions specifically benefit tenants (against landlords) and eight that balance the rights of the landlord and tenant (eg. changing locks). How many uniquely benefit landlords? 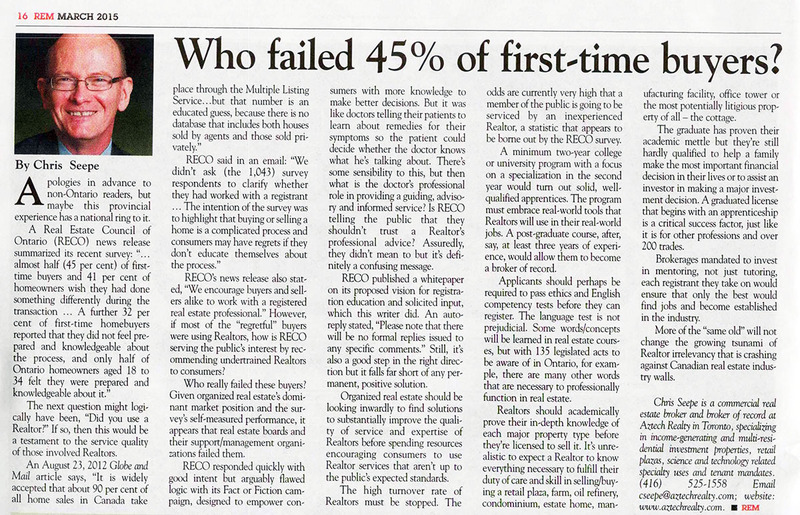 A Real Estate Council of Ontario (RECO) news release summarized its November 2015 survey: “… almost half (45 per cent) of first-time buyers and 41 per cent of homeowners wish they had done something differently during the transaction ." A Globe and Mail article stated, “It is widely accepted that about 90 per cent of all home sales in Canada take place through the Multiple Listing Service ..." Who failed these buyers? A 2014 update on a solar panel review done in 2012. Green' is often a euphemism for 'money' and rental property owners faced with major capital costs are likely going to give the highest priority to the use that makes the best overall business sense, with return on investment likely being a major factor. This story looks into the pros and cons of, and the business case for and against, installing roof-based solar panels. How many people in Canada are in the market to buy a 28-room summer home with 1,450 acres of land, 9,000 feet of lakefront, three wet slips, two farms and a modern four-bedroom log cabin? At $12 million, very few, so broadening the buyer field through exposure to a worldwide market is essential. This is not a post-it-on-the-MLS-and-wait-for-calls kind of listing. 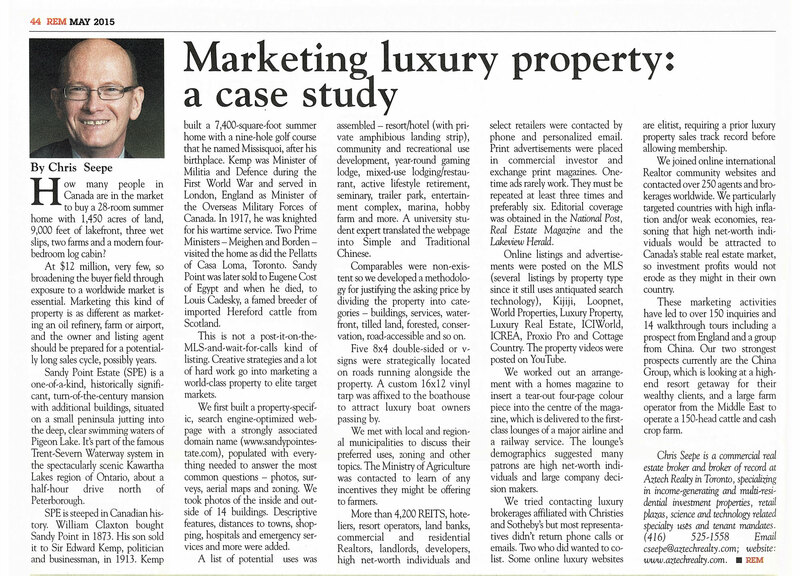 Creative strategies and a lot of hard work go into marketing a world class property to elite target markets. A 2016 update on a solar panel review done in 2014. Pricing of solar panel systems continue to drop and the microFIT payout drops in synch with that. The business case remains essentially the same. Getting a microFIT application approved id becoming much more difficult. Why are investment opportunities becoming more difficult to find for Canadian real estate investors? How will Canadian Organized Real Estate (CORE) need to change to embrace the tsunamic events that are bearing down on Canadian Realtors and what can Realtors do to brace for the impact? Why are landlords among the last to embrace the many benefits of electronic payment processing (EPP)? Why do the banking deposits when your tenants will do it for you? Why expose yourself to unnecessary Privacy Act legislation? Why accept even one more NSF charge? 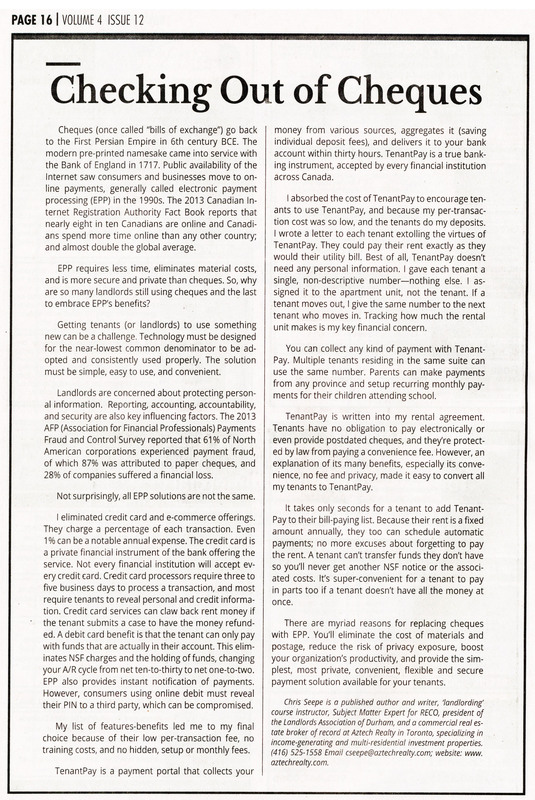 A more condensed version of the above article. This 1:15 minute segment briefly answers the interviewer's question: What is the single most important thing to look for in an a commercial real estate investment. This 3:49 minute segment looks at the trials and tribulations a Toronto-based micro-brewery experienced in trying to find a location that met their sometimes conflicting business needs (an "industrial" place to brew with a retail pub for sit-down customers in a trendy area with an upwardly mobile demographic. Our 27-second interview starts at 1:18. The reasons to be a landlord are mostly obvious. 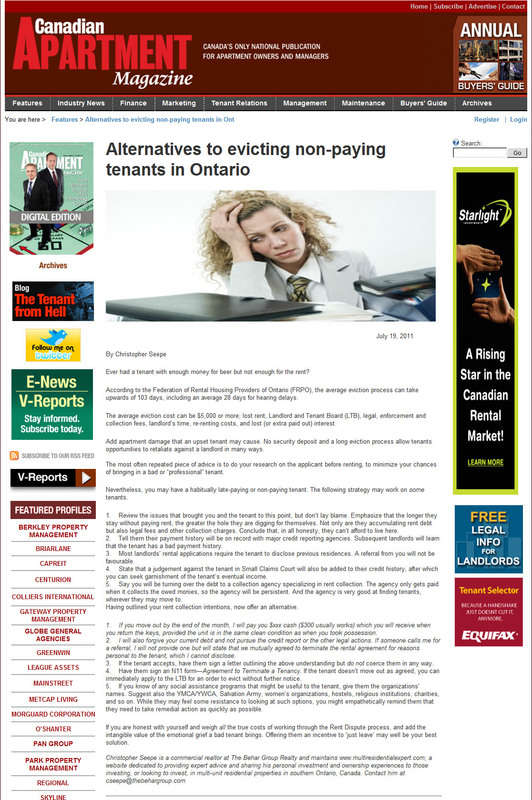 The reasons not to be are, by themselves, not big deterrents, but making just a few of these mistakes can cause you a great deal of misery and pain, especially if you operate in Ontario, Canada, one of the world's most heavily-regulated rental housing markets. Buying or selling a multi-residential property is a commercial transaction and requires many more considerations than a typical house transaction. It also requires a different set of considerations than most other types of commercial real estate transactions, primarily because tenants’ homes and the Residential Tenancies Act are involved, and many costs that can be passed on to a commercial tenant cannot be passed on to a residential tenant. Like any other business in today’s litigious-prone society, supported by tenant-biased judicial authorities, you must take the time, and undertake proper due diligence, to ensure that you protect yourself in the operation of your landlord duties, or you will inevitably suffer the consequences. And, right after you've done a thorough credit check, you'll want a robust and balanced rental housing agreement like the one described in the article. 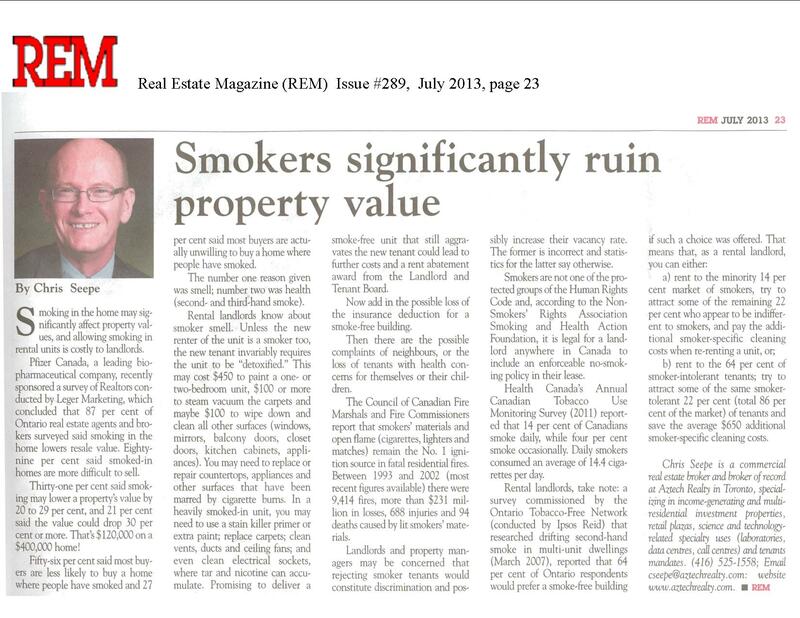 Smoking in the home may significantly affect property values, anywhere from 10% to 30%, and allowing smoking in rental units is costly to landlords. If you have not purchased a multi-residential property before, and especially if the number of units is greater than six, you may be surprised by the myriad costs involved. This article lists and discusses most of the types of closing costs you could expect to pay, and providing estimates where possible for some of those costs. Ontario is among the most heavily-regulated rental housing markets in the world, and the favouritism shown to tenants by all political parties and levels of government has created some unbalanced legislation, as well as significant business challenges for rental housing owners and operators. This article looks at what the Landlord & Tenant Board spends most of its time doing and how it has become absolutely essential that landlords astutely qualify their applicants to reduce their ever-increasing risk exposure. Insurance companies are in the business of not paying out for damages, and will look for every means and angle they can to reduce or refuse to pay for your losses. The purchase price (market value) of a property is very often not representative of what it would cost to rebuild it. This article delves into the difference and what you must do to ensure your investment is not wiped out by a catastrophic event. The landlord renting to an international fast food restaurant chain (franchisee-owned location in Scarborough) demanded an increase in net rent. The franchisee observed that the increase was not sustainable by the current revenue stream. It was determined that the location was part of a high-traffic "destination" mall and the asking rent was reasonable. We speculated (but did not confirm) that the demographics of the mall customers had changed dramatically over the years since the franchisee's location was opened, and that the new customer demographic was not suitable to the resturant's product offerings. 'Green' is often a euphemism for 'money' and condo boards faced with major capital costs are likely going to give the highest priority to the use that makes the best overall business sense, with return on investment likely being a major factor. This cover story looks into the pros and cons of, and the business case for and against, installing roof-based solar panels. Investing in and then leasing commercial space may seem like no-brainer, but there’s more to the process than meets the eye. From finding the property to finding the right tenants to securing the rent, here's your must-read primer. Evicting a bad tenant in Ontario, Canada can be an expensive and stressful process for a landlord. Two-thirds of all the applications processed by the The Landlord & Tenant Board (LTB) are for eviction due to non-payment of rent. Here's an alternative. Any investment in real estate is about location. This is no less true for multi-residential properties where the economy, future growth and building types all play an important role. This article interviews Chris Seepe and others from around North America about what is important when looking for a multi-residential investment property. Scammers are sneaky and sly. They can target anyone, from youngsters to retirees. They can also target businesses. No one is immune to fraud. The Competition Bureau's group of superheroes has found a way to see through the scams. Their secret is simple: knowledge is power! Read on to find out how you can also become a fraud-fighting superhero. Share this booklet with family and friends and start powering up! The following articles have been published on Monster Commercial.com, an exhaustive online resource for tenants and investors. - How much insurance should you have for your multi-residential property?